S tarfighter Decals touts itself as being a company that makes decals for classic kits. By that, they mean older kits for which there are either few decals and accessories, or ones for which what has been done is very difficult to locate. 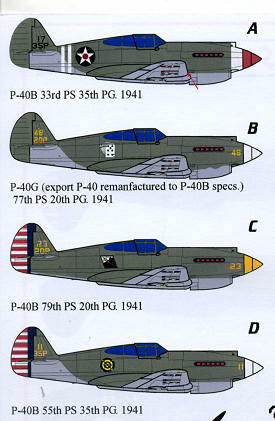 This new sheet provides the modeler the markings for four 1941 era P-40B/C aircraft. All of them are in Olive Drab over Neutral Grey. I found it interesting that the tail area demarcation line is not the same on all schemes. The sheet comes with enough common markings to do two complete aircraft. 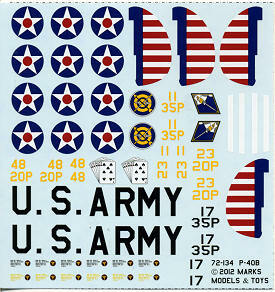 If you can find additional US ARMY decals for under the wings, you can do three and if you find more insignia, you can do all four. Two of these planes are from the 35th Pursuit Group. The first one with the two white fuselage bands the white nose and res spinner is from the 33rd Pursuit Squadron. You will note that this aircraft has fuselage insignia and black unit ID markings on the fin. The last on on the drawing with the white spinner, rudder flag, and unit badge is from the 55th Pursuit Squadron. The 20th Pursuit Group covers the other two markings. The one with the white nose and no rudder flag is listed as a P-40G, which is an export P-40B. This aircraft is from the 77th Pursuit Squadron. The other aircraft with the yellow spinner is from the 79th Pursuit Squadron. This aircraft has the lower camo demarcation line under the tail. Interestingly, the first aircraft shown has an all black prop while the other three have polished aluminum props with Maroon 18 backs. I have not seen anyone with this color in ready mix paint. The decals themselves are superbly printed and though it is not so stated, they look like they are done by Cartograf. For kits, the only three that come readily to mind are the very ancient Frog kit and and a somewhat more recent Academy offering for the oldies. The much newer Airfix kit is probably what most will use for this sheet.